When you crave a steak, nothing beats a steakhouse dinner. 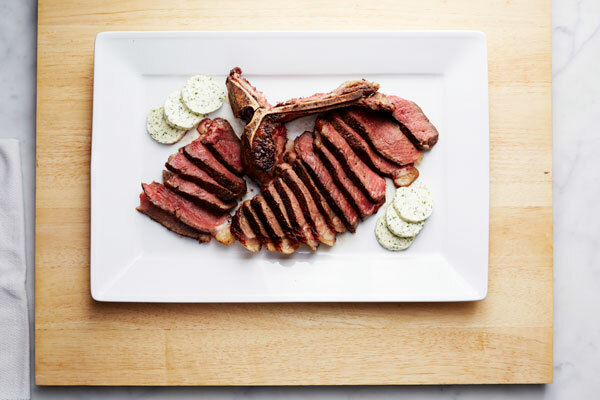 In this episode, Martha makes five of her favorite menu items: a Classic Martini, Baked Stuffed Clams, Porterhouse Steak with a compound butter, Creamed Spinach and Baked Potatoes. They’re all guaranteed to satisfy a big appetite. This baked stuffed clams recipe appears in the "Steakhouse" episode of Martha Stewart's Cooking School. For the Stuffed Clams: Heat olive oil in a pot over medium high. Cook onion until softened but not browned, stirring occasionally, about 5 minutes. Add garlic, and saute, stirring, just until fragrant, about 1 minute. Add wine, and bring to a simmer. Add clams, and stir to combine. Cover and steam until clams have opened, 5 to 7 minutes. Remove from heat. Use a slotted spoon to transfer clams to a rimmed baking sheet to cool, discarding any that do not open. Strain clam broth through a fine sieve, and reserve for making stuffing. Preheat oven to 350° F. Dividing evenly, press stuffing into clam shells, smoothing with the back of a spoon. Bake until tops are golden, 25 to 30 minutes. Nestle clams on seaweed, if desired, and serve immediately. For the Herbed Breadcrumb Stuffing: Heat olive oil in a saute pan. Cook onion and garlic until translucent, stirring frequently, about 5 minutes. Remove from heat and let cool completely. Stir together onion mixture, almond flour, breadcrumbs, herbs and butter in a bowl; season with salt and pepper. Stir in just enough clam broth to moisten stuffing.